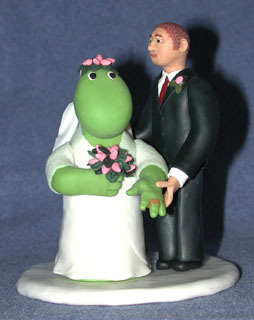 For my sister's wedding, I made a personalalized cake topper from polymer clay. 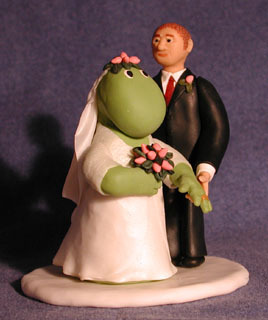 She's been nicknamed "the dragon" due to her hot childhood temper, and I've made her dragons before, so of course the cake topper should feature a (friendly) dragon. My earlier dragons have been guys with big bellies, but in this case it would of course have to be slim and ladylike. I based the wedding dress, veil, and bouquet, on what I knew she planned to wear. Flowers in her hair was a wild guess, that turned out to be wrong. It was really fun to watch my sister's reaction as she first laid eyes on the cake topper during the wedding. She almost stared in disbelief, enjoying the unexpected surprise immensely. She was even happier when she found out that the topper was made from polymer clay rather than marzipan, so it wouldn't decay over time. The bodies are made from a thick layer of clay over a core of crumpled up aluminium foil. 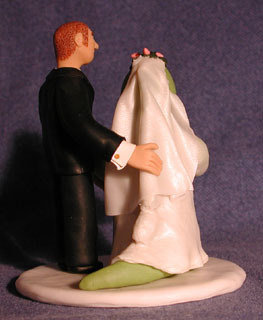 The dress and veil are made with clay I flattened in a pasta machine (use only for polymer clays, never for food). I made the veil as thin as possible, and learned the hard way that some brands of transluscent clay turn yellow in hardening... I had to scrape off the first veil, bit by bit, and add a new one using a different brand clay. Wish I'd made some samples first to see how it would behave! I adapted the back of the dress to conform to the dragon's saw-tooth spine. The tail is showing beneath the dress. For the groom's buzz cut hairstyle I made a cane with a finely dotted cross section, and covered the head with slices. The photos show my first attempt, which turned out too light (the dark brown clay I had used turned light brown from hardening). My next attempt, using black, turned out much better.